In an alphabetic writing system, a silent letter is a letter that, in a particular word, does not correspond to any sound in the word's pronunciation. Silent letters create problems for both native and non-native speakers of a language, as they make it more difficult to guess the spellings of spoken words or the pronunciations of written words. More than 60% of English words have silent letters and nearly every letter of the English alphabet is silent in some word! 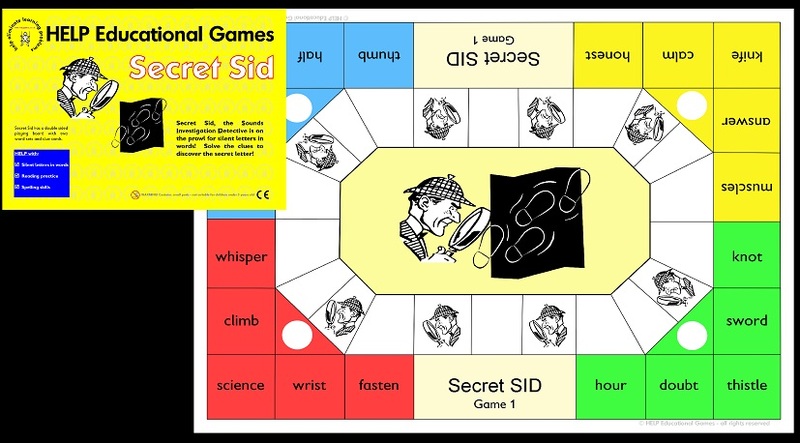 Secret Sid is another fun game! The Sounds Investigation Detective is on the prowl for silent letters in words. Clues are given for the words that hide the silent letters. The game includes 2 word sets and can be played by 2 to 4 players or teams. Children enjoy solving the clues to discover the silent letter in the answer!